When we do reconnect with past visitors, we are delighted to hear about their personal healing experiences using our herbs; and how they have progressed, and in some instances, transformed their lives forever. Christine is one of those visitors. 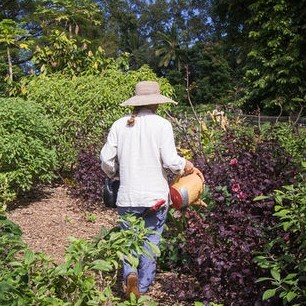 After visiting the farm and touring our gardens in March 2018, we received several emails from Christine, sharing in detail the highs, the lows and the revelations of her herbal healing journey. 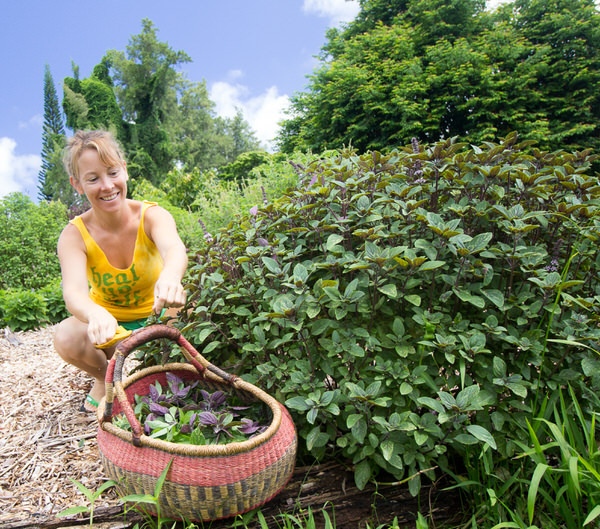 Mahalo Nui Loa (Thank you so very much) Christine for sharing your story, and for giving us permission to share your personal experience using Kauai Farmacy plant medicine with others. Below are excerpts from several of Christine’s emails that we felt you might appreciate. I just wanted you to know that I am beyond delighted with all your products and I’ve been using them! 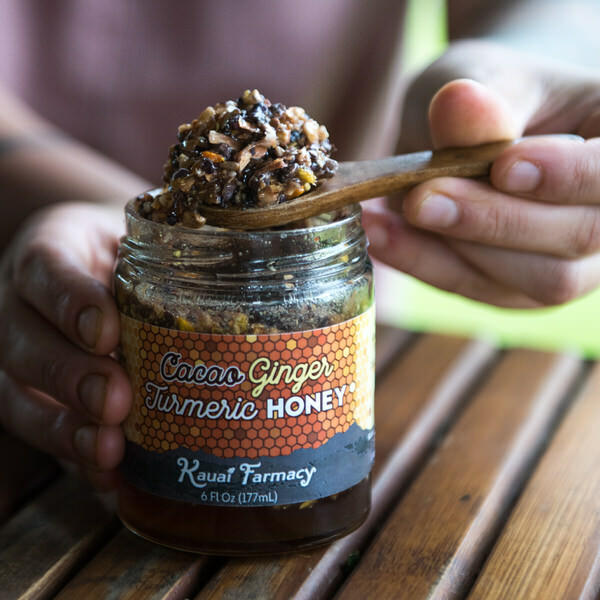 The honey is just about gone and the plant powders seem to appear in just about every dish I make…I have gone through some highs and lows as expected from the teas and tinctures but I’m no stranger to the effects of detoxing and understand how beneficial it is. Boils, fatigue, headaches, brain fog etc. but I’ve been taking lots of hot baths with Epson salts, drinking a ton of water, rebounding and getting lots of rest. As I type this, today is coincidentally the best day so far and I’ve been feeling incrementally better over the last week. I can’t wait to see how I feel this summer and intend to get myself back to the gym! As much as I’ve evolved my earlier rock bottom state of health, I feel your plants are the icing on the cake. 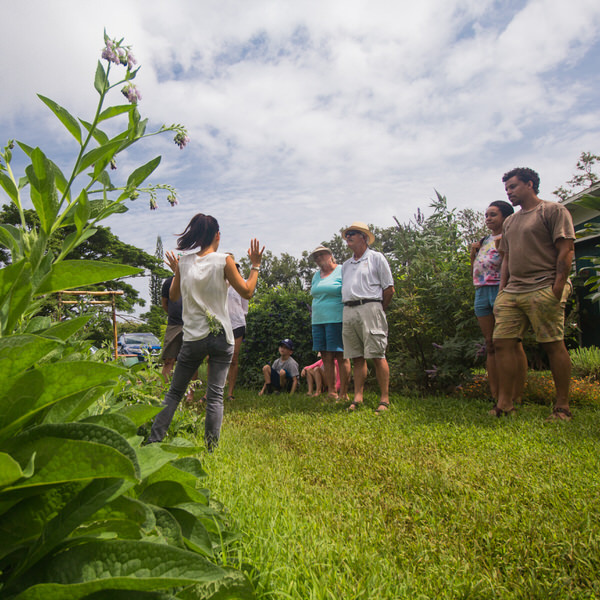 The farm that I visited in Hawaii is called Kauai Farmacy. Over the past decade I have spent hundreds of thousands on so many healing modalities, treatments, therapy and supplements. That said, I’ve learned a lot and can tell from a distance what is pure and what is not. Diana and I had a tour of their medicinal garden and it literally blew my mind how anyone in this day and age could run a thriving business with such highly intrinsic standards. For starters, they exceed the bar for organic gardening as not one chemical is ever used. No soap, no sprays, nothing. In fact, they make large bats of fermented tea which they use to fertilize with a watering can by hand as there’s no use of machinery whatsoever. They also practice what’s called bio-diversity which means they don’t just logistically harvest rows of the plants in chronological order which is how 99% of agriculture is grown today (including medical herbs). Instead, they listen to the wisdom of the plants (aka god) and arrange them according to how they prosper collectively. Much like the natural order and process of the different organs within the human body. Trial and error also has played a large role as their gardens have evolved to a point I feel is unprecedented in North America on such a scale. They revolve their business around the plants first, then their client’s needs. If a plant isn’t ready, the tea won’t be sold until it is. Their tulsi tea was sold out for over a year as they waited until the time was right. They didn’t outsource for tulsi or use a man-made approach to speed up the process either. Oh, and the soil is rich in minerals from being volcanic and virtually untouched. I was in awe over how utterly perfect the plants looked and tasted without the need for intervention. After the tour, I literally bought every tea, tincture, salve and powder they had on the spot as I not only understood the value but I felt it. I heard it in the owner’s voices with sincere expression. At the end of the day, I was looking at an original painting created by god himself. Not a print or a watered down digital copy but the real thing untouched and framed in its original glory. That’s what this Farmacy really is. I’ve been drinking their teas for two months now and I have had some highs and some lows. As time goes by however, I’m seeing way more highs with more energy, mental clarity, digestion, sleeping, clearer and better skin I’ve ever felt and seen. What most people don’t realize is for the body to heal, it has to detoxify and in doing so, all the toxicity that crept in over the past 20-40 years must go out and it’s not always easy. The process requires patience, going easy with the tea (pulling back when needed), tons of good quality water, rest and emotional support. I have found the Tranquility tea to be their best foundational tea as it’s helped me sleep and deal with daily stress like no other. Next, I really like the tulsi along with the gotu kola tincture which is amazing for the brain and ironically looks just like it. No coincidence. Anyhow, I’d be happy to talk to you about this as I have tried every product and can shed light on them from my own personal experience and what I’ve learned along the way. I have to say that since a few more weeks have passed, I cannot begin to tell you the immense gratitude I have for you, your team and farm as I’m starting to feel really good. Over the past decade I have literally spent hundreds of thousands attempting to heal my health condition. Over the past two months, your herbs have become an integral part of my life as I’m beginning to experience, clarity, sustained energy, emotional stability and sleep I have never experienced in my life. For years my diet has been primarily organic, 90% plant based with no milk, gluten, gmos or alcohol. Yet your herbs provided the most positive turning point yet. I really mean that. My daughter Diana also loves your tea and has been bringing it to school to sip throughout the day. Her hair is beginning to look healthy along with her skin which is starting to glow as this has been missing for some time. As her mother, I’m doing cartwheels and I’m even happier I have the energy to do them! Genna, I honestly feel that I was guided to your farm and to meet you was no coincidence. Your tour was by far the most memorable part of our trip to Kauai and since returning home, all I can do is talk about it. So many of my friends and clients are suffering with all kinds of health issues and I know that Kauai Farmacy is one of the main answers to their prayers. Everyone needs to understand the value of your offering and the only way that can be done is to really experience it and for long enough to be transformative. I can tell you with certainty that my mind is clearing up with a presence and energy I’ve never had before. 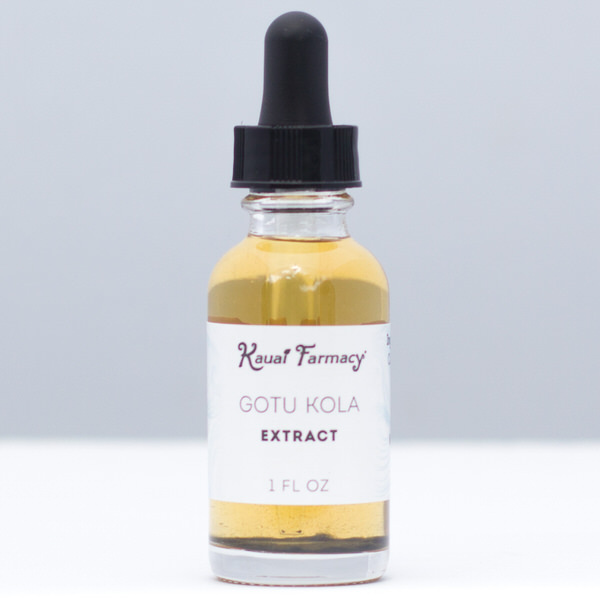 I am SOOOO glad you suggested the gotu kola tincture in addition to the teas as it’s really the icing on the cake. I have this incredible clarity that allows me to focus and collect words much faster when I speak. As of yesterday, I managed to do my 3rd hot yoga class in a week and I have no more pain. The reason why I am sharing this is I firmly believe that the gotu kola and teas have induced my body to a state that it’s able to clear itself of blockages that prevented my brain to work optimally. Not just consciously but intuitively as well. A bunch of my friends have also bought some of your teas and so far the reaction is positive! 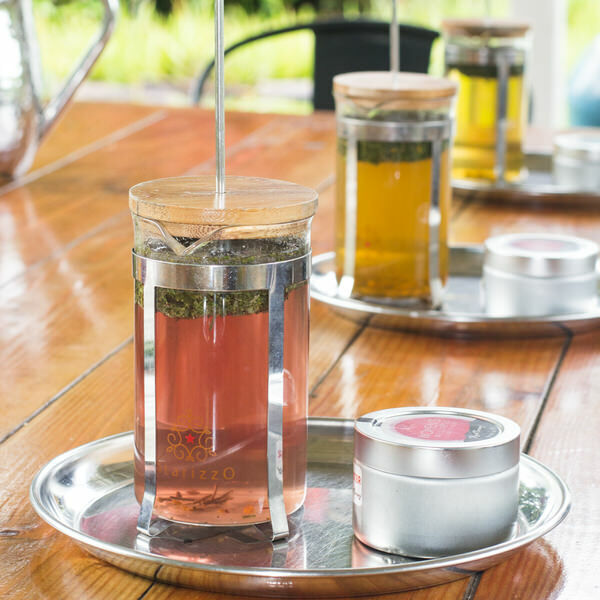 The world need to drink your tea one cup at a time! I am so grateful and wish everyone could feel this good.